← Sew It, Grow It, Show It – Sell It, Teach It? Trail/road: All over D.C., including some neighborhoods that I probably wouldn’t have gone to by myself – but I’m glad I did! Company: Hundreds of other glowing, smiling riders! My favorite bike shop, BicycleSPACE, never needs an excuse for a party. But a few weeks ago, they had a very good reason for one. They were not only celebrating their two-year anniversary, but it was on a blue moon. Was there ever a better time for an end-of-summer night ride? 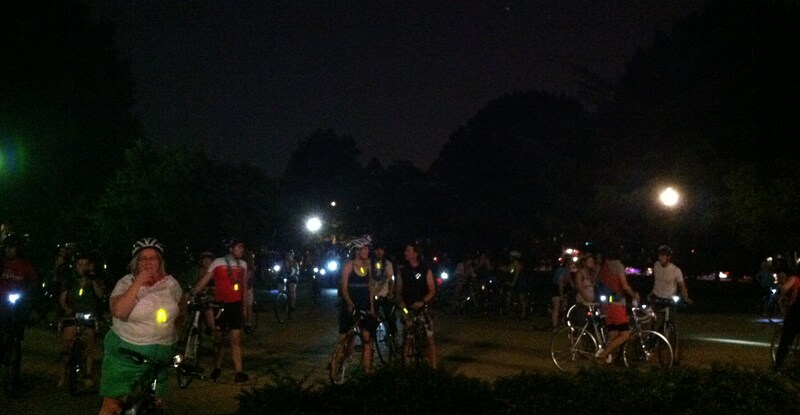 After the staff decked us out in glowsticks and leis, the ride began with a leisurely ramble up to Dupont Circle. Although I never needed to refer to it, the shop sent us a cue sheet for the first time. Even though I’ve never gotten separated, I felt better having actual directions just in case. At Thomas Circle, we flew down the tunnels that run under D.C.’s many roundabouts. While there are some brave (or fool-hearty, depending on your perspective) cyclists who use them in regular traffic, I know I can’t maintain the speed or gumption to do it. But when you’re with hundreds of other cyclists, you can do anything! As always, the pedestrians and onlookers were encouraging. A number of them reached out from the sidewalk and over railings to give bikers high fives. My balance isn’t good enough to do that, but I did a lot of smiling and waving. While the first half of the ride was slightly marred by disorganization, they had it all worked out soon enough. Most BicycleSPACE rides have a number of volunteers that block intersections so the group can go through red lights and not split up. It’s a standard thing on large rides, as the tighter the group stays, the easier we are to see and the less road we’re blocking at any one time. Unfortunately, the beginning of the ride lacked these volunteers and we kept getting separated. We even ended up at the wrong park for the pit stop! 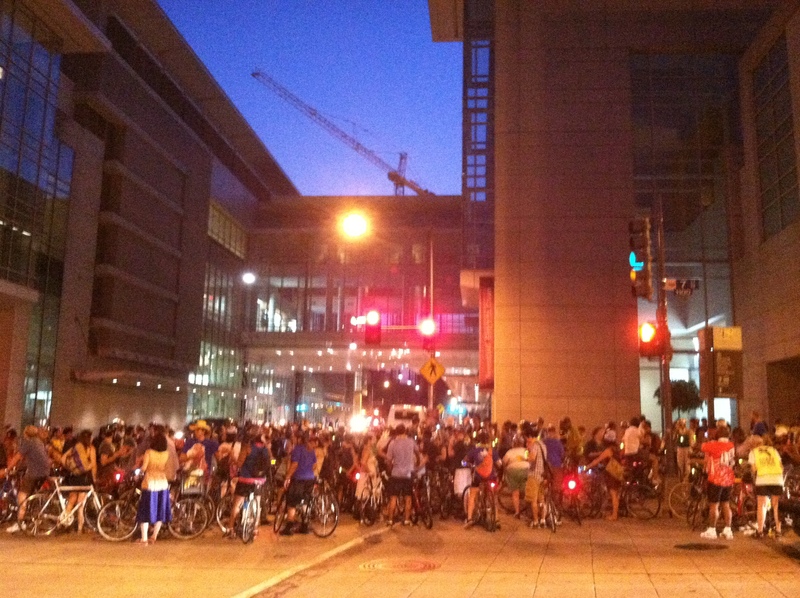 Thankfully, the organizers worked it out and we had excellent support from the D.C. police on the rest of the ride. They blocked the intersections for us, protecting us from the accusation that we were doing something “illegal.” While most drivers don’t mind, we always get a few that are seriously annoyed. I usually feel a little bad about inconveniencing someone, but I did have a sense of delicious revenge when we blocked a Hummer. When we got to the real pit stop, I had quite a surprise. 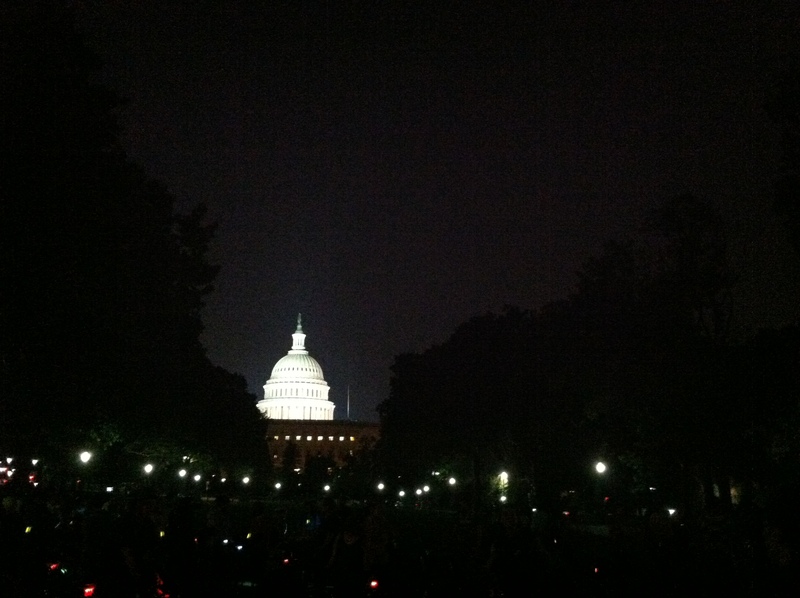 I was riding by myself and wandering around the Lower Senate Park near the Capitol. As I was briefly checking my phone, someone asked, “Would you like some champagne?” Startled into silence, I recovered, looked up and said, “Sorry, why?” A young-looking woman said, “Because it’s my birthday and I’m not carrying all of this back. We also have cake.” Although champagne didn’t seem like a good idea, considering I’m a lightweight, I readily accepted some cake. We chatted for a while, and then went on our individual ways. It was one of those moments where you’re sharing life with someone who was a stranger just a moment ago, but now is certainly much more than that. Times like those, where you can experience a sense of community growing naturally, are one of the things I enjoy most about these rides. I also met this dude and his bike, which he uses to bring bikes to sick kids at hospitals. So many cool people. 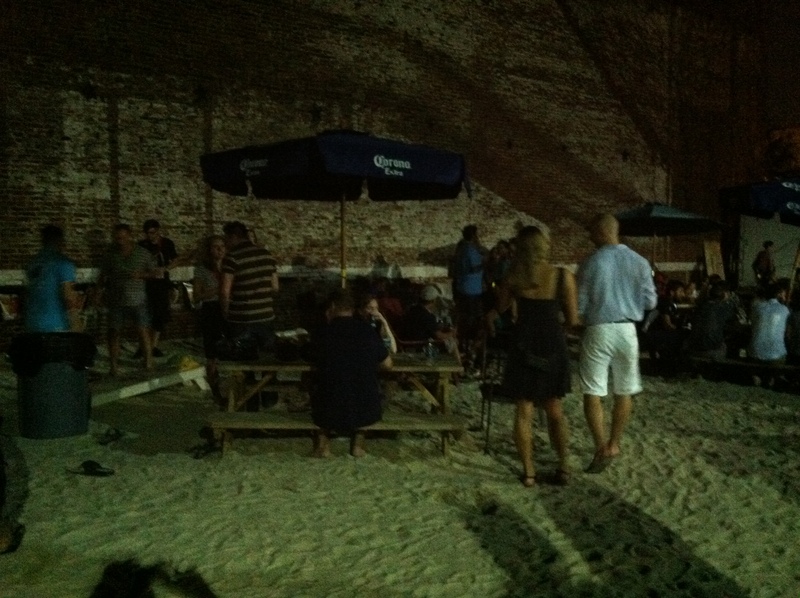 The ride ended at the New York Ave. Beach Bar, which is both surreal and perfectly named. The owners took an empty alley in D.C., cleaned it out, and dumped tons of sand into it. With picnic tables, corn-hole boxes, stereo speakers, and a couple of bars it felt like you could just maybe, if you squinted, be at the beach. A smile spread across my face, and only got even bigger as I drank a Chain Degreaser, otherwise known as a rum punch. It was the perfect ending to a celebratory ride. Looks just like the beach, if it was surrounded by brick walls! This entry was posted in biking, community, Washington DC and tagged bicyclespace, bike culture, biking, community bike ride, washington dc. Bookmark the permalink. What a wonderful ride – lovely company, cycling in the night (which I seriously love) and, if that weren’t enough – glowsticks!!! I know exactly what you mean about those sorts of chance encounters. They happen so often when you bicycle. They somehow seem, just for a while, so very important, as though you’ve just been allowed a glimpse at some big, comforting, fundamental truth about life. Then you realise its raining or you have to get off the train and you know you won’t see that person again, but, you continue on with your day glowing warmly (and in my case often humming a little tune). Indeed. I love that welcoming feeling. It’s one the best things about my neighborhood and it’s something invaluable about these community rides. It sounds fantastic! I’m going to have to jump on one of these the next time a full moon comes out. You don’t have to wait for a full moon! 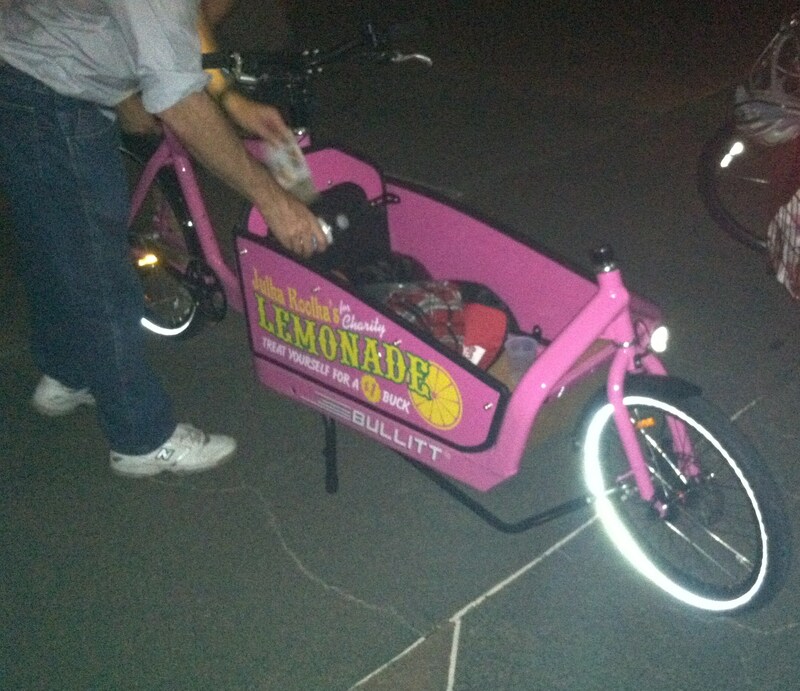 BicycleSPACE has community rides all of the time, at different times of the day. Seriously, I don’t work for them and don’t even live nearby, but I love this shop.